The astronomy program Stellarium was used for identifying an appropriate moment for the second part of this analysis. It has many good qualities about it and extremely accurate in its functions, and can be made to show certain features and representations upon the viewing area, which include the ecliptic line; the meridians or cardinal directions; view including the ground, or without it but showing the horizon line; azimuth and equatorial grids; and the constellations according to different nations. It can be adjusted for time either forwards or backwards, through thousands of years. Also, different viewing aspects can be accessed, from a simple directional view that appears like the sky we naturally see, to altered views such as Mercator, like the maps that we are used to seeing where all degrees from east through north, west and south are equidistant, while above and below the horizon the degrees stretch slightly the further one goes from the horizon line; Cylinder, where all degrees are the same no matter which direction one views; a Fish-eye type of view, and several more similar to this, where the view of the sky is curved the further one sees to the sides from the centre of the view. The object of defining an appropriate moment in time depicting the celestial sky is to align the image upon the pyramid. As we have the view of the pyramid as being from the west looking through it to the east, the orientation of the astronomical image will offer up a particular aspect that aligns with the pyramid, and have a particular axis to use in aligning to the pyramid. We know there are four directions that are possible, and any one of them could have a particular significance over the others as being the right axial alignment upon the model. While viewing the model from west through east, and picturing the astral field in Stellarium, there came to be one definite view that satisfied an alignment: south. In considering several other pyramids, a northern entrance is not always the only one, and sometimes there have been eastern and western entrances as well as a northern entrance. While looking south faces the direction of the equator and the Sun, north faces the direction of the northern circumpolar region of the sky. It can be easily accepted that having a northern entrance identifies the sloping passage as being accessible by the direction and/or light of the northern polar star, but stepping towards the south may indicate the direction to be faced by those partaking of the purpose of the pyramid. We know that the circumpolar point sits a little higher than the angle of the entrance passage aims at, but it is possible a star it was aiming for was not exactly upon the polar point but crossed the northern meridian at approximately 26.523º above the horizon. Only from sifting through the offerings of Stellarium will the correct overlay be found, and it will depend upon exacting particulars including the orientation of the pyramid when the overlay is used: a north or south orientation overlaps the alignment of the chambers while placing the passages all upon one vertical section; orienting from east through west has the entrance passage beginning on the right side of the view; and orienting from west through east has the passage on the left side of the view. The orientation would not matter if the boundaries were only being considered, but for astronomical alignments it does matter and means the difference between the possibility of certain stars and such being in specific locations, or not. There are many possibilities for this search, depending on the position of any one of the major stars in our sky, especially those that were considered to be the most important to the ancient Egyptians. The most important star to them was Sirius, so the search through all time periods will need Sirius as the major influence, while others will also have some bearing upon the alignment of overlay upon pyramid. Such stars as Alkaid, Arcturus, Betelgeuse and Rigel, Aldeberan, Pollux and Castor, Procyon, Antares, and Capella, Vega, Hadar, Altair, and of course Canopus could all play roles upon this construction. It is possible that only a few of these stars will have any bearing upon the pyramid, and certainly possible that other stars from the constellations we know as Leo, Ursa Minor, Auriga, Cassiopeia, Capricorn, the Crux or Southern Cross, and the Pleiades might be more important. Also, the planets and the Moon could have some bearing, but certainly sifting through the range of dates is the only course, and testing anything and everything and paying particular attention to Sirius is the only way to eventuate at a correspondence between astronomy and architecture. There came to be several possibilities that showed promise, and none of them were this side of 10,000 BCE. By considering Sirius as the most important part in all this, there appeared two initial dates to begin from. The first of these dates is 12,118 BCE, July 2nd, just before dawn. The image below shows this moment as mapped at the Great Pyramid's location, and is composed of several features provided within Stellarium that represent particulars of astronomy. The vertical centre green line is the southern meridian which crosses the horizontal green line of our horizon. Very close to this intersection, the bright light of Sirius is seen, resting just a little to the west of south and above the horizon, and Orion spread out further right from Sirius. The bright star down below Sirius is Canopus. As we are aligning the Ancient Egyptian night sky to the pyramid, the sky is seen through their eyes, with their constellations and configurations, and Orion is shown as Sah, and is much larger than the Orion we know today. On the extreme left is another vertical green line, indicating the northern meridian. With south in the middle, north is on both sides of this view, showing the spread of the sky through all 360 degrees, while above and below the horizon the sky extends nearly 70 degrees in either direction. At the 90 and 270 degree locations horizontally, east and west are indicated as the intersections of three important lines. 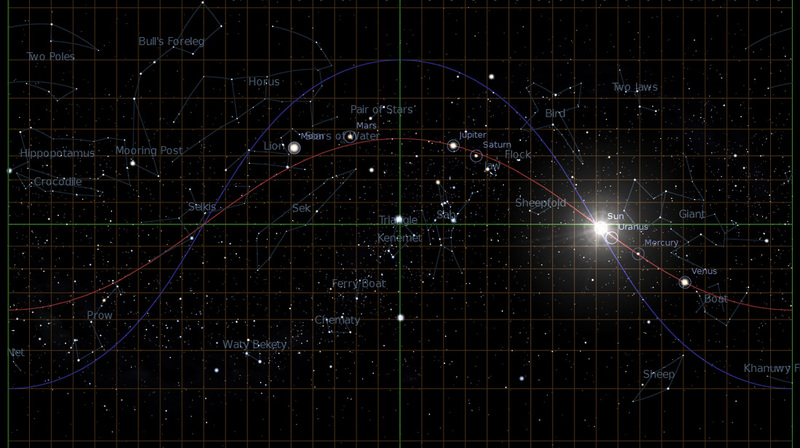 The red line is the ecliptic, the path the Sun appears to travel upon as we orbit it, and also the mid-plane that the Moon and planets appear to follow. 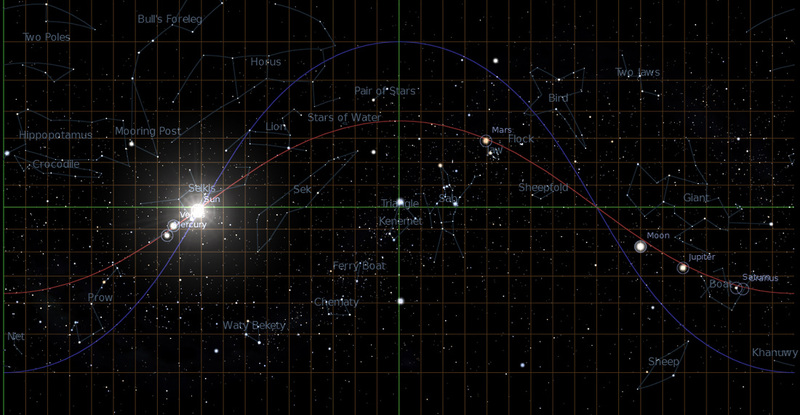 The blue line is the equatorial line of the sky, showing our equator projected out upon the cosmos and how the tilt of Earth relates to the Sun and sky. At this very moment being shown, with the Sun just below the horizon and the three lines of the ecliptic, equator and horizon being presented like this, due east and due west are indicated at the intersections of these three lines, and these 'triple intersections' will be called TI going forward. The other potential astronomical date to be considered also has Sirius in a particular location, and the following image is of December 22nd, 12,020 BCE. Having these two dates and astronomical views soundly relies upon Sirius being at a particular longitude, with the first one showing Sirius at 180º 33' 33”, while the second one shows the star at 179º 26' 31”. On these opposing dates, the Sun is just below the horizon but holding a specific location which will be understood in the next section when the astronomy is overlaid upon the pyramid. There are slight differences to the layout of the stars on the whole, but certainly Sirius is slightly over one degree in longitude removed between the two dates, being 98 years apart. When we consider the equatorial line, we see that it holds a curve that meets the horizon at exactly 90 and 270 degrees longitude, rising up in a smooth arc where its highest position of altitude according to Stellarium is approximately 60º 1' 15", or 60.020825º upon the southern meridian. This azimuth reflects the location of the pyramid at approximately 29.979175º latitude, with the two amounts equating to 90º. This equatorial line does not change its position throughout the year, and only slightly changes through great lengths of time due to the movement of the Earth's tilt, raising or lowering its arc according to the background stars but still holding its shape. At the positions of 90 and 270º longitude, the Sun rising and setting is done so during the equinoxes of the year, exactly following along the line of the celestial equator. When Earth rotates in its orbit about the Sun, the line of the ecliptic rises and falls because of the tilt of Earth, currently at about 23.5º, which makes the Sun take a rising and falling line during its apparent motion through the sky. On the equinoxes, due to the intersection of ecliptic and equator, the Sun exactly follows the equator as viewed from Earth. During the solstices, the Earth-tilt makes it appear that the Sun will have two extremes of rising and setting because the intersections of ecliptic and equator are no longer observed where the Sun is located. While the equator will always hold the same arc through the sky, the location of the Sun moves either northwards or southwards upon the horizon from due east or due west, taking the centre point of the arc of the ecliptic with it, and altering the path of the Sun through the sky. In either hemisphere upon Earth, summer occurs because the Sun is more-so rising and setting within the latitudes of that hemisphere, and reaches a solstice at the furthest point of angle that the Sun rises and sets when the tilt of Earth and its rotation reaches an equilibrium of observation. In the northern hemisphere, the summer solstice occurs when the Sun rises at approximately 62º 46', or 27º 14' north of due east, the furthest point that Earth's tilt currently observes on the date of June 26th at the location of the pyramid. For the time of 12,118 BCE, summer solstice occurred on October 6th, with the Sun rising at approximately 26º 57' north of due east. The Earth's orbit about the Sun is defined as taking one year, or 365.25 days, but this is not an exact orbit for it is obvious that the Sun would be in a slightly different position against the background stars. In what is known as the Precession of the Equinoxes, when an exact amount of time is chosen for the Earth to complete exactly one orbit, the Sun has moved a little under one minute of a degree according to its position against the stars, which amounts to approximately one degree every 71.6 years. Accordingly, the Sun migrates through the constellations of the ecliptic and takes approximately 25,772 years to appear once again in a singular position, while there is a small range of time in which Precession can take place due to the slight differences given to the rotation and orbit of Earth. This range means Precession can take up to 25,920 years to occur, while some estimates has the length as little as 24,000 years, and this because of tidal influences and the moon coinciding with perihelion or aphelion, and also the slighter pull of the planets when planetary alignments occur. These influences can slow down or speed up the motion of Earth, and it is quite possible that a certain average is around 25,000 years. The Earth-tilt or obliquity, while currently being 23.5º, has a minimum and maximum which has been estimated at between 22.4º and 24.1º. It has been estimated that this range takes about 41,000 years to cycle through. This wobble also affects how the stars appear at their zeniths over great lengths of time, which means that during a precessional cycle while the Sun is slowly changing places against the background stars, when it returns once again to its beginning point, the background star it is in front of will appear either slightly higher or lower at its zenith because the Earth-tilt is not the same as it was some 26,000 years previously, being some 63.5 % into the 41,000 year cycle. This could amount to approximately 0.6º difference in height, and certainly affect the apparent position of the Sun according to a background star, and also the position on the horizon this star appears to rise from. Precession of the equinoxes is one thing over a long period of time, but obliquity also has a role to play. While these cycles are a little daunting to imagine, one thing that we can grasp is that due to specific angles and moments in time, we could pinpoint particulars of certain things if they have been recorded for us, especially in such a construction as the Great Pyramid being some four and half thousand years old. It has an estimated location of being at latitude 29º 58' 45.03", or 29.979175º north of the equator; its angle of slope of the exterior is accepted as being approximately 51º 51' 14”, or 51.8539º for a height of 5,776". This slope has been proposed as exhibiting a process upon the pyramid due to the height of the Sun on a particular day being able to shine down the far north side where for most of the year it lays in shadow. Some ten weeks before and after the winter solstice is when the north side becomes lit and then falls into shade again, and this means the Sun does not light the north side for some twenty weeks of the year, while for the rest of the year the north side is lit, being some thirty three weeks of the year. The effect of sunlight extends to the slight concavity of the sides: the rising of the equinoctial Sun shines its light upon the western area of the south side of the pyramid due to the western half being slightly further south than the centre of this side. The Sun also shines upon the eastern half of the south side of the pyramid at sunset. It can be imagined that the location of the Sun at dawn is in such a position that where it rises upon the horizon is at an exact angle that its light does not touch the eastern half of the south side, which would make the south east edge of the pyramid, rising from ground to apex, such a precise line of shadow that the edge flows through to fall very precisely upon the the very centre of the whole south side of the pyramid due to its concavity. For just the days of the equinox that this occurs on does show the extraordinary precision of construction where the equinoxes have such an effect upon the light-play. Accordingly, the latitudinal location of the pyramid means this concavity would be more or less than it is, in order to define the same effect. Pyramids range up and down the Nile River upon its west bank, constructed similarly but yet quite differently one from another. With angles, measurements and locations, it would appear the ancient Egyptians enjoyed recreating the forms as representing some grand expression that was very important and more than ritualistic or spiritual, and yet between the many of them, it appears that few certainties were carried from one to another. With the placement and shape of the Great Pyramid, it can be accepted that very exacting particulars are understood regarding its influence from the Sun on one level, and that these particulars relate to specifics that were recreated in this particular pyramid according to a specific moment, if not a general moment recurring throughout the year then certainly a singular moment throughout a greater span of time like that of the Precessions. The south side identifies the equinoxes, and these moments are for the south side entirely, while other aspects of the pyramid are for other moments. The north side interacts with the Sun when light shines down upon it once the Sun has reached a particular height that equals the north side's angle. Accordingly, once the north side becomes full of sunlight after the winter solstice, it is only a matter of weeks before the spring equinox occurs; and similarly, once the north side loses its sunlight, it is only a matter of weeks before the autumnal equinox occurs. When pyramid building seemingly first exploded upon the scene of ancient Egypt, Pharaoh Djoser of the third dynasty at about 2,630 BCE is credited as beginning the trend. His complex at Saqqara, not far south of Giza, is identified as being a leap in construction techniques, turning the burial practices of a rectangular mound – called a mastaba - covering chambers that housed the dead Pharaoh and the accompanying offerings that went with him, into a multi-layered mastaba, or in Djoser's case, the Step Pyramid. It was approximately 60 metres tall, with a footprint of some 120 x 100 metres that overlay a vast network of tunnels and chambers beneath. Investigation into the pyramid has defined it as being constructed in stages and certainly enlarged entirely, taking it from a size approximately two thirds of its completed size to what it would eventually become. About one hundred years later, Pharaoh Sneferu began constructing and his efforts would amount to four pyramids, two of them the third and fourth largest of all pyramids built. Sneferu also implemented the construction of chambers within the pyramids that had them above ground level and be three distinct chambers, the similar of which are found in the Great Pyramid, and yet only in one or two more pyramids would above-ground chambers be recreated. For the most part, a northern access to the internal structure of the pyramids would be passed along to subsequent pyramid builders, but Sneferu would include a western entrance to his second pyramid, the Bent Pyramid at Dahshur. In all the pyramids, there would be several with western entrances, and a few with entrances from the south and even the east, but the north is the most favoured. It has been quite the enigma why the earliest pyramids had above ground chambers within them, and even a western entrance to one of them, and yet these were not accepted as being definite blueprints for pyramid construction on the whole. To understand what was special about these first pyramids and the Great Pyramid in particular, and that there was a plan that was understood for only a short time before some reason made it disappear from acknowledgement and acceptance, we will have to combine the astronomy and the architecture. It is also possible that due to this analysis, more light might be shed upon other pyramids. With the two dates mentioned, defining which is to be the correct one comes down to overlaying the astronomical images upon the pyramid model, and assessing which one is more correct than the other, although both can support a check and balance because of the position of Sirius on either side of the meridian. The position of Sirius so close to the meridian is necessary because it is hoped that the niche of the Queen Chamber is placed as it is because of some fundamental reason, and this reason may be due to Sirius rather than some unknown ritualistic reason. The offset of the niche from the central axis of the chamber – and the entire pyramid – is a very important component of the architecture, and the main influence in seeking some special observation of Sirius being close to the southern meridian. But the niche is one factor of the whole. In considering the shafts actually pointing to significant astral bodies, then certainly the Sun is an important object to identify, and the southern shafts both have degrees that would include the Sun taking up a position within their foci. Rather than having a true angle associated with the shafts, the logical angles would be what they actually are, and taking an average of both Petrie and Gantenbrink's results, we can accept that the upper shaft is approximately 45º 13', and the lower shaft is approximately 39º 02' for their upper lengths, no matter all the angles associated with their progression. In identifying particular dates throughout the year, there are eight days that signify transitions according to where the Sun is located in its rising and setting, and hence its height in the sky. It is simple enough to accept the solstices and equinoxes as exhibiting the midpoints of each of the seasons, but between each of these are cross-quarter days that exhibit the actual transition between the seasons. Petrie states that the Sun shone down the upper shaft on two days per year: February 8 and November 2. For the February date, this is midway between the winter solstice/midpoint of winter, and the spring equinox/midpoint of spring; in other words it was the transition date for going from winter to spring. For the November date, it is midway between the autumn equinox/midpoint of autumn, and once again the winter solstice. If we are to accept that the shaft aimed at the Sun, then these two dates are quite important because they equally surround the winter solstice. There appears a very intricate use of numbers between these two dates, and one that equates to the angle of the pyramid in a way that must be more than pure coincidence. From November 2nd to February 8th is 98 days, but the Sun takes a little less time than a full day to reach the same position in February as it did in November to shine down the shaft. By bringing in particular numbers, we can see what this length of time actually is, and also see the angle of the pyramid, and wonder out how coincidental this actually is. Using a very good estimate for the length of the year as 365.25 days, we include the angle of the pyramid of 51º 51' 14.4”, or 51.854º, and the cube-root of this angle as a number, being approximately 3.729015. The year divided by this equals approximately 97.948118, which is the amount of days between the two dates for the Sun to shine down the shaft. It is a neat equation, and somewhat too neat unless the perfection of the pyramid's construction specifically relies upon exacting observations of the Sun, meaning the Sun is important to the pyramid's plan. With the angle of the lower shaft, it aims at the Sun on the dates of January 15 and November 26, and these do not have any kind of significance to do with solar positioning and might represent a local phenomenon instead that is related to the Sun. Otherwise the shaft indicates a position of a star, and as the stars do wander due to the duality of Precession of the Equinoxes and Axial Precession, then it would have to be a particular star at a particular moment in time. It can be seen from Stellarium that at about 2,585 BCE, Sirius was crossing the southern meridian in the general area of the focus of the lower shaft, and this is a good period equating to the time of Khufu. While the shafts do exhibit a slight difference in their southerly directions despite their vertical angles, it could be considered that the two shafts are in their positions to pinpoint a particular moment: the upper shaft towards the Sun and the lower shaft towards Sirius, locking in an exact date that indicates either the birth or beginning-reign of Khufu, or it locks in his death, if these are influenced by Khufu and his time-period. Otherwise they represent specific dates and moments according to another time period. Either way, the Sun and Sirius cannot be aimed at at the very same time but within approximately 7 1/2 hours of each other, with the Sun first. In assessing the north shafts, it is slightly more difficult to identify their exact directions because of the bends that have affected the journey through the pyramid on their way to their ends. We know the upper shaft reaches the outside of the pyramid but in which direction it actually aims is problematic to lock in; all we can be sure of is that at about 2,585 BCE, the vertical angle suggests it was aiming at a star that was very close to the northern circumpolar point without being exactly the pole star, such is the difference between the pole-point and the shaft angle. The latitude of the pyramid reflects the polar position, and their degrees are very much exactly the same, and as the upper shaft's angle is approximately 31.5º, Thuban appears to be the one intended, as it was the one identified as being the polar star at this time, and Stellarium agrees with this. For the lower shaft, an approximate angle taken from Petrie and Gantenbrink has a little over 39º vertically, but again the true direction might be up to a couple of degrees from side to side, so an estimate has to be made for which star is being focused upon. Potential stars include Kocab, Mizar, Alioth, and Pherkad, as these all pass within a few degrees of the shaft's direction in 2,585 BCE. In knowing the height of the north circumpolar point, we can be certain that the entrance passage did not focus upon it, so we can really only speculate as to which star this might have been indicating, if indeed a star was its intention. Petrie has its definite angle of altitude as 26º 31' 23" +/- 5", and its azimuth offset westwards of true north by 3' 44" +/- 10" - and this is the angle and offset for the entire passage. For the built part alone, Petrie states that the angle is 26º 26' 42" +/- 20", and the offset is 5' 49" +/-7". This means that for the length of passage carved out of the bedrock, the angle of altitude would be approximately 26º 36' 04", and the offset would only be 2' 05", give or take a little. While it is not a great envelope to worry about, it is still approximately 10 arc-minutes high and 3.6 arc-minutes wide. The possibilities for the shafts were much greater. For Khufu's time, no discernible stars passed by this window from the passage, and for the period surrounding 12,000 BCE, Vega is the closest star but does miss the exact direction of the passage by some 2.5º. As such, the entrance passage might have a completely different association instead of aligned to a particular star in the north as viewed from the passage itself. In the case of the ascending passage, and also the angle of the gallery floor, it can be acknowledged that very few stars passed by that window of area that the passage aims at beyond the pyramid, and the ones that did are Nihal and Gacrux. While Nihal is a star associated with the Sah/Orion constellation, it is a minor one and an important association might be attributed from a local phenomenon, such as representing a particular God or person rather than an overall celestial importance. Certainly Gacrux is a major star in The Crux/Southern Cross constellation, and could warrant some importance, but it is undetermined if this would also warrant association with the gallery.